A honeymoon in Moorea means a holiday in a Polynesian beach paradise! 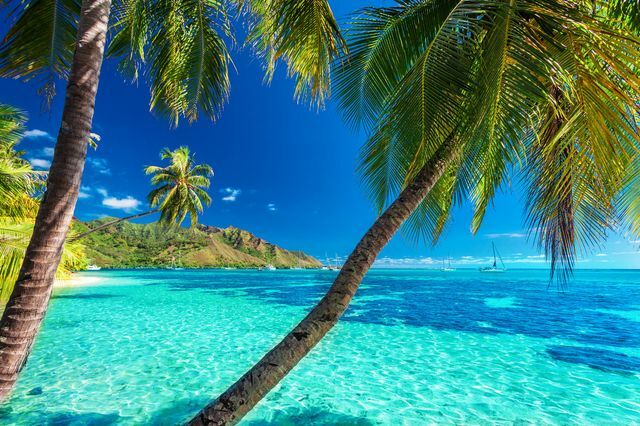 Honeymooners looking for an elegant and exotic beach honeymoon should look at spending theirs in Moorea, French Polynesia. Moorea caters to a wider array of honeymooners than the farther flung and more exclusive islands. While it won’t be cheap, there are options for travelers in the $100 to $250 per night range. And of course given that it’s French Polynesia, the luxury sector is well-looked after. The activities on offer are consistent with a destination dominated by its beaches. That said, the interior of the island offers various options for exploring, natural sights, historic sites, and other attractions. It’s great for hiking and mountain biking, if you feel up to a more strenuous activity. Down by the water, enjoying the postcard-perfect sand and water is a simple but not to be overlooked pleasure. The waters are excellent for swimming, snorkeling, surfing, and diving. The surrounding waters are teeming with local marine life that is sure to make your time in the water special – you can swim with sharks, turtles, and stingrays in addition to the many colorful local fish. Your honeymoon in Moorea is going to be unforgettable! The tropical island of Moorea experiences two seasons, a wet summer (December to March) and a dry winter (June to September). However, summer temperatures range from 85 to 87 degrees, while winter temperatures are an agreeable 82-84. The drier winter is a considerably more popular time to visit, though don’t expect low season discounting anywhere in French Polynesia. Most will arrive by air via Papeete (Tahiti). Belvedere: Lookout This spot offers amazing views of Mt. Rotui, Cook's Bay, and Opunohu Bay in addition to an ancient temple on the way. Waterfalls: There are numerous waterfalls scattered around the island which require a relatively easy hike. You may be required to pay a small fee to visit. Beaches: Unsurprisingly, the beaches are the main attraction. Some are private (eg access exclusive to a resort) and others are public. 4x4 off-road tour If time is short, a 4x4 tour is a great way to explore the interior of the island quickly. Jet Ski Tours: As a counterpart to the 4x4 tour, the jet ski tours allow you e to explore the coast line – having a guide is necessary due to their knowledge of reef formations and other potential hazards. Horseback Riding: A more leisurely tour of the island can be had on horseback. Diving: Numerous operators take groups on dives with the highlights being lemon sharks and sea turtles. Hiking: Those looking for an active honeymoon will enjoy the numerous trails on the island. Black Pearls: Moorea features many shops and boutiques specializing in black pearls, if you are in the market for a very special souvenir. Roulottes: Not a casino game – these trucks sell affordable examples of local cuisine. Mountain Biking: Numerous mountain bike trails also exist, as well as operators offering rentals and tours. Magic Mountain: Make sure to stop here if you’re driving or on a tour – the views from the top are incredible! Moorea Tropical Garden: This garden features a variety of tropical fruits, exhibits a bit of Polynesian culture, and offers attractive views.